At my very-sweet-and-not-demanding-at-all request, my husband recently built our 3 year old daughter a beautiful bookcase for her ever expanding collection of books!! SHE LOVES TO READ! And that’s an understatement. From an early age (and seeing as she’s only 3 I’m talking EARLY age here) she would gravitate toward books, asking us to read and re-read them over and over again, or we would find her flipping through the pages of a book in her room with a stack of others beside her. A lovely bookcase for a lovely girl. Like mother like daughter I guess because (and you can ask my mom and dad!) books were my compatriots. As an army brat who often said goodbye to awesome groups of friends, I would turn back to the faithful pages of my favorite written works or find new ones to enjoy. He even put a detailed footer and mixed a custom pink shade at home for the inside!! Our daughter is in love with her one-of-a-kind, hand made bookshelf from her daddy and I’m in love with all the books fitting neatly on the shelves … until they end up on the floor again I guess. 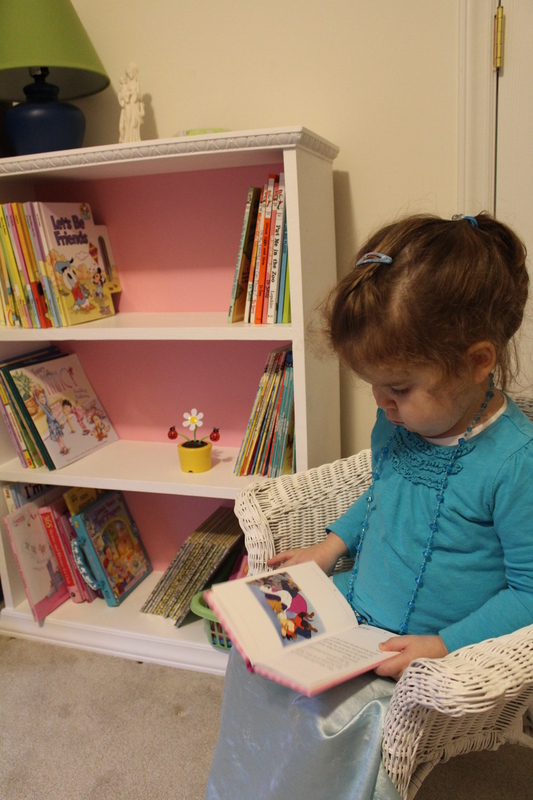 With her avid love of reading, it’s only a matter of time before they’re strewn across her room, down the hallway, and into other rooms. Oh, well. When it gets quiet in the house, I can always find her using the trail of books to guide me and, inevitably, … she’ll be reading. What’s your favorite book now? or What was your favorite go-to book growing up? Please share in the comments below! Next Here’s to you Tessaniacs! I used to get the Butter Battle Book (by Dr. Seuss) from the library all the time for my Dad to read to me. I eventually learned that it was a historical allegory and used it in my own classroom. We also LOVED getting Miss Rumphius and the Angelina Ballerina books from the library. It has been so fun collecting these books as I have grown into adulthood.